042 – The Goonies | All Eighties Movies. All The Time! Hey you guys! This week Gidgit and Angry are in Astoria Oregon, looking for the treasure of One Eyed Willy! 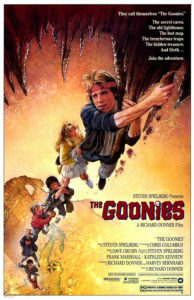 Goonies never die and this classic from the 80’s is just as much fun today! Ohh wham! Awesome podcast. That sums it up. Fantastic. Goonies!!! Yes! I love it!!! I’ve listened to loads of Goonies podcasts. All different I have to say. Credit to you both as ok not my favorite but up there for sure. Loved it. I especially love all the trivia about the film. Good job again.